It’s that time of year when the elements begin to threaten your plants. Protect your plants against low temperatures, wind, frost, and snow by following these tips. If you can, bring that warm-weather plant inside for the winter. These vibrant plants can be used to decorate your home as they’re receiving much-needed protection from winter weather. When this isn’t feasible—due to space limitations, for example—outdoor plants can also be transported to the garage or sun room, where they can be exposed to temperatures at least ten degrees warmer than what they’d be experiencing outside. Determine where potted plants need to be placed by making note of their sun requirements; those that need the most light should be situated by east and west facing windows while those that don’t need as much sunshine can sit by windows that face to the north and south. Either way, your plants shouldn’t be too close to the windows, as the cold can affect them if they touch a pane. Vents dry the air so also try to keep houseplants away from them. When heat and moisture escape from soil during the winter months, plants suffer. Protect the vulnerable root systems of your plants by applying a layer of mulch two to three inches thick to the soil surrounding them. Consider wheat or pine straw mulch, as these varieties trap heat effectively and are easily removed in the spring. Mulch can serve another purpose as well: Some plants, such as roses and strawberries, benefit from being covered by mulch in the winter. Mulch helps plants survive the winter, but it needs to be raked back in the spring so the soil and plants can be exposed to the warmth of the sun. Plants that can’t be transferred inside can still be saved if they’re covered throughout the winter. Old blankets, drop cloths, and tarp are examples of materials suitable for protecting plants from frost, though they can’t fight cold temperatures. To avoid damaging plants, prevent coverings from touching branches and leaves. This requires either spreading the covering out or propping it up with stakes. Winter means strong winds; weigh or tie down your coverings so they don’t blow away. Don’t secure these materials too tightly, however. Since plants still need exposure to air and sunshine, coverings will need to be removed during the day. Feeling ambitious? 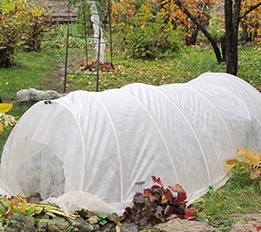 Go the extra mile to protect your plants by building them a cold frame or greenhouse. Be aware that these projects require some advanced construction effort and the results aren’t especially attractive. On the other hand, cold frames and greenhouses are simply the best ways to protect plants during the winter. Constructing a cold frame involves slender metal rods bent into loops. The ends are then stuck into the soil across a garden row. Here, clear plastic sheeting acts as a covering when it’s placed over the loops. Unlike simple coverings, a cold frame protects plants from frost and traps heat. This is clearly beneficial, but it also means that cold frames need to be ventilated on particularly hot days. If you’re anticipating a very cold night—but not a hard freeze—it’s wise to water your plants thoroughly. Wet soil is better at trapping heat than dry soil. Unfortunately, this trick will backfire if used on succulents or frozen soil, which need to be left alone. A heat source can save plants on extremely cold nights when used in combination with a covering or cold frame. Christmas lights and 100 watt light bulbs can be used as heat sources for plants, as they reach temperatures that are high enough—but not too high. Place these lights inside of a covering or cold frame, keeping them close to plants but not so close that they’re touching, which could cause burning. Extension cords and other materials used to connect your heat sources must be outdoor-safe. Unplug heat sources during the day to allow ventilation and prevent bulbs from overheating, which could cause a fire.